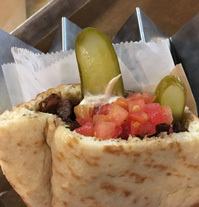 Miznon is a lively spot for Mediterranean street foods inside Chelsea Market where the music is loud and the food is flavorful. The ribeye sandwich is a standout favorite with thin slices of well-seasoned beef mingling with tomato, pickles and tahini. It’s the type of sandwich you will have trouble putting down. A lamb kebab, folded cheese burger and fish sandwich are also available. Choices abound for non-meat eaters, as well, including grilled wild mushrooms with scallions in a spicy sauce, a bag of beans (which is literally a bag of green beans) and baby cauliflower. During our visit I overheard one customer apologizing to his server for hesitating when the cauliflower was recommended, saying “I don’t even like cauliflower but it’s friggin’ delicious.” The playful staff and quality of the food help Miznon stand out above the crowd.